Dedicated to fostering a deeper understanding and appreciation of the country school experience. For those who are involved in one-room school preservation, history or re-enactment. YOUTUBE: What is the CSAA? CSAA JOURNAL: Get Published Here! 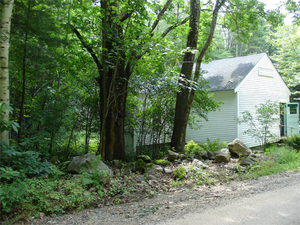 The little white schoolhouse sits by the side of the dirt road where it has withstood 182 New England winters and 728 changes of the seasons. Built in 1825, The Lower Corner School in Sandwich, NH, originally named the John Quincy Adams School and later District #16, survives today as the headquarters of the Sandwich Historical Society and a site for both living and re-living history. Local classes use the schoolhouse today to experience a day in a country school. 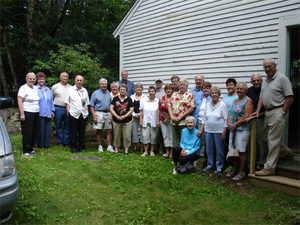 On a fair summer day in August, threatened by clouds from a month of violent thunderstorms, a stalwart group of former students met at Lower Corner for their Annual Alumni Picnic to share their stories and their lunches. The fondest memories were undimmed by time, repeated over the years as a testament to the country schoolhouse education they value to this day. Of all the memories shared, one was of a teacher named Mr. Bigelow, who taught in the schoolhouse after World War II when it was used as a junior high for a short time. Former student, Hubert Atwood, said, "Either he didn't fit or we didn't fit." He had no "way" with the students as he had come from the military and tried to regiment the students with discipline. They quietly rebelled with their antics. They stuffed the chimney to block the smoke and one student, Bobby Nudd, actually SAT on the chimney to smoke Bigelow out of the schoolhouse! In fact, the most memorable accounts involved pranks! 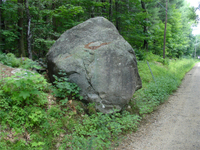 There was and still is a huge boulder down the road a short distance from the schoolhouse where you might see smoke rising from it's top...the boys were out sneaking cigarettes again. Those at the reunion told how a student actually threw 22 shells into the stove and the fireworks began! Or, the boys would smash 22 shells on the boulder. They recalled how students once found pollywogs in their sandwiches at lunchtime, and how boys would shoot off "matchstick" darts..." when Bigelow was there." Boys admitted to drilling a hole in the trap door of the privie where they congregated to take a peek into the girls' side. It was clear that the students agreed on one thing in particular. Their favorite teacher was Alice Pierce! One former student said, "She made everyone feel like they were the teacher's pet." She decorated the room and drew colorful borders around the blackboard and read to them from Pollyanna, from adventure stories, and poetry. Hubert Atwood said, "She was the best teacher I ever had!" Others remembered the Christmas program each year, cutting the tree right in the woods, and families donating lights to string on the tree when the school was electrified. 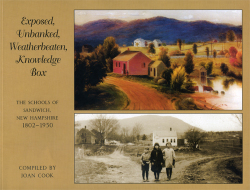 Joan Cook and Janet Bickford, former students of Lower Corner School and members of the Sandwich Historical Society, attended CSAA's 7th Annual Country School Conference in Nashua in 2007 and were gratified to learn just how many people are involved as they are in the preservation of one-room shcoolhouses across the nation. 5-MINUTE VIDEO: WHAT IS THE CSAA? 2019 CSAA Conference Registration Now Open! CSAA Conference, June 17-19, 2019, Frederick, Maryland... Call for Presenters! Happy New Year and Season's Greetings to All! Save the Date for CSAA Conference 2018! Memories from one-room school teachers in the Texas Hill Country. A guide for all preservationists and historical societies who are saving our country schools. Fifth grade teacher P.J. Hartenaus enjoys bringing history to life with tales that her students can relate to in the present. While exploring the unglaciated area of Galena, Illinois, Hartenaus came upon a deserted one-room schoolhouse called Belden. That discovery led her to find journals from the 1800s, artifacts, and 166 tales of a time long ago as told by the elderly students who once attended Belden School. Today, the story lives through Peter McDugal, the young hero of the Belden Boy Series. A rich ethnographic description of Amish education in the 21st century. Today a beloved national icon, the one-room schoolhouse has played a variety of roles in America's popular memory. JoAnne Olian: Children's Fashions, 1860-1912: 1,065 Costume Designs from "La Mode Illustree"
A must-own for all schoolhouse preservationists! Appropriate clothes for "schoolmarms" and "schoolmasters"...Blouses, skirts, vests etc. The One-Room Schoolhouse Center website was created in 1998 as a way to provide an online resource for those interested in learning more about early education in the United States. 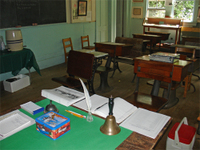 The history and reminiscences from those who taught and attended one-room schoolhouses are prevalent throughout the site. U.S. Flags for Your Schoolhouse! Need a U.S. flag for your schoolhouse? All years available with the appropriate number of stars! This company has them all! NPR Report by Nina Ellis highlighting life in seven ORS across the U.S.
A digital collection! Click on the Browse Books button for a complete list. What a resource this is for museum schools! So many ideas for teachers and curators. Reprints for your schoolhouse programs. Best source for used books with competitive pricing. Toys and Games. 18th/19th century: Colonial, Civil War & Victorian. Reproduction schoolbooks for reenactment and/or for sale in museums.